Dance Commentary by Heather Desaulniers: "A Midsummer Night's Dream"
Hamburg Ballet in Neumeier's "A Midsummer Night's Dream"
Dreams can be strange, confusing and non-linear; starting out one way and then morphing into something else without explanation or warning. And so, a ballet about a dream should be equally odd and curious. In another mid-February engagement at San Francisco’s War Memorial Opera House, the Hamburg Ballet returned with a full-length production encapsulating this universal experience – Artistic Director John Neumeier’s “A Midsummer Night’s Dream”. Perfectly timed for Valentine’s week, unexpected love and intertwined relationships take center stage in Neumeier’s 1977 version of Shakespeare’s comedic masterpiece. “A Midsummer Night’s Dream” takes its participating characters on an unusual journey, oscillating between the conscious and the sub-conscious and revealing the porousness that exists between the two states of being. The ballet’s most notable achievement is its dream sequence, which makes up the majority of Act I. Appropriately weird and mystical, the dream successfully blurred the lines between reality and fantasy. Manic motion and constant change were expressed through extremely fast boureés, Russian pas de chats and grand rond de jambes. A sense of ‘the unexpected’ even permeated the partnering, leading to some spectacular visuals (including a mid-air developpé à la second). Add in smoke effects, ambient music and mobile set pieces, and the result was a deliciously unpredictable apparition. Translating Shakespeare’s comedic tale into a non-textual format is not easy to do. The complex scenarios, the varied characters, the interwoven lives; all three presented a big challenge. By the end of Act I, things were starting to become clear, but even with a general understanding of the plot, it was a little hard to keep track of what was going on. Having said that, with a storyline like “A Midsummer Night’s Dream”, some uncertainty may have been the right call. The length of the production was problematic. About three-quarters of the way through each of the two acts, there was a very clear and palpable stopping point. The audience reaction in those moments spoke volumes; they thought each half was over and their presumption seemed right. But in both cases, the action continued for quite a while longer, and because definite cadences had already occurred, it felt extraneous. In particular, Act I clocked in at around eighty minutes. The style and choreography of this “A Midsummer Night’s Dream” may not be to everyone’s artistic taste, but the dancing itself was phenomenal. The leads were great: tremendous technique, believable acting and artistic sensitivity. However, the real stand out group was the men’s and women’s corps de ballet. 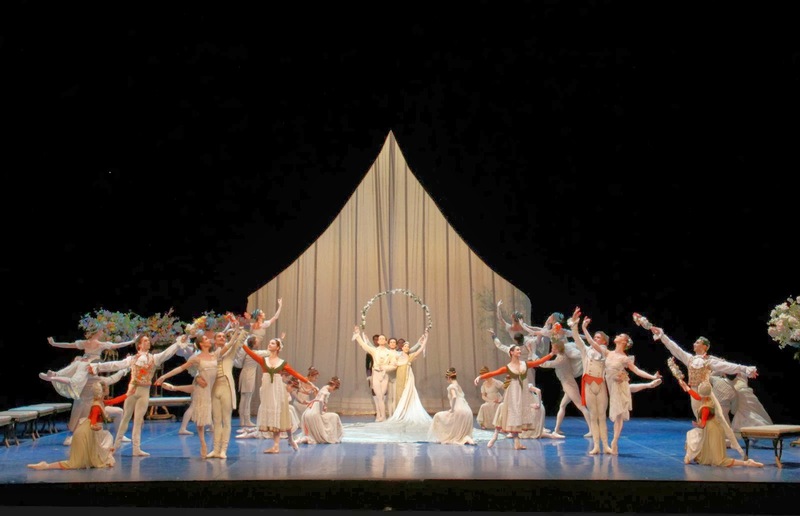 Neumeier’s “A Midsummer Night’s Dream” charges its chorus with both traditional (in the first scene and at the wedding) and contemporary ballet vocabulary (during the dream). Each corps dancer met that call with authentic intention, mature confidence and technical acumen. They were a delight to watch.